To install Connecter, click on the button above to download the zipped installation, then unzip, double-click the exe. file and follow the steps. It will just take a minute or so. … your custom settings are still there for future Connecter installations. If you want to remove all Connecter files and settings from your system select that option when uninstalling. There’s nothing to do! Connecter will automatically check for a new update and install it on the next start. The script will be automatically installed the first time you drag and drop asset from Connecter into 3ds Max. Make sure that both applications are running in administrator mode. The same as the C4D Open command from the “File” menu. The difference is that you can drag and open multiple files from Connecter. Merges the file that you are dragging from Connecter and locks it to the cursor position. ▪ You can skip the popup menu and directly start the merge function by holding CTRL, while dragging a file from Connecter. ▪ Left mouse click clones the object that was merged. ▪ CTRL + SHIFT + Left mouse click will increment the H rotation of the object by 45° clockwise. The same as the Cinema 4D Merge command from the “File” menu. The difference is that you can drag and merge multiple files from Connecter. Replaces the object that was under the mouse when you stopped dragging from Connecter. replace the source object of the instance or to replace only this particular “Instance” object. the new one, so they don’t lose the geometry. • If some error is encountered, a log is generated. of the viewport. You can click that to cancel/end the operation. end the operation. This was done for optimization purposes. • All texture paths are converted to absolute paths. This is tested for Native, Vray, Corona materials. It was reported that Octane also seems to be working. Just drag a folder (or multiple folders) and drop it in Connecter’s Folders panel. Or use the “Add folder” icon in Folders panel’s header. Now you have your first folder added – we call it “Root folder”, and you can add as many root folders as you like. Only Root folders can be removed. To do so, hover your mouse over the folder, then hover over the icon that appears on the right and click “Remove” in the context menu. To hide a subfolder, hover your mouse over it, then hover over the icon that appears on the right and click Hide from the drop-down menu. The folder is no longer visible in your folders panel. If you need to use your hidden folders, at a later date, simply click on Folders in the panel’s header, and check “Show hidden folders” in the drop-down menu. Now all your hidden folders are visible again. To unhide an individual hidden folder, first make sure “Show hidden folders” is checked. Now hover your mouse over the folder you’d like to unhide, then hover over the icon that appears on the right and click “Unhide”. In Connecter it’s so easy to filter out by name folders you don’t really need (e.g. “Temp”, “Work”, “WIP”). To ignore folders by their name, go to the Folders panel drop-down, type the folder’s name you want to filter out and click the + button. A new folder will appear in the drop-down with the folder’s name you’ve just filtered. All folders with that name will no longer be visible in your folders list. To clear an existing ignore filter, go to the Folders panel drop-down, hover over a folder’s name in the “Ignore folders” list and click the x icon that appears. For ease of use, by default, Connecter is showing you only the most common 3d industry’s file formats. You can find and manage a list of all default file formats organized by type (3d files, Materials, Images and Others) in Settings > File types. You can also add any other file format you’d like Connecter to display by adding its extension and pressing the + button in Settings > File types > Others. You can quick filter what file types (e.g. 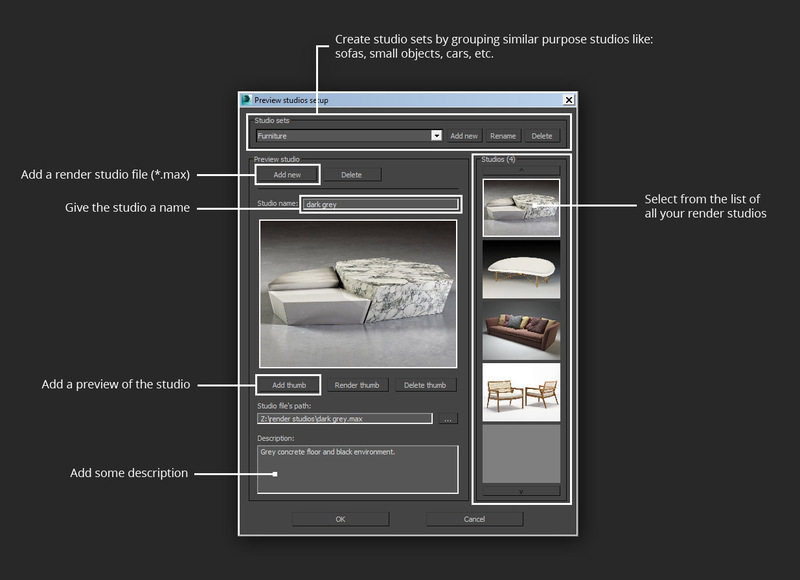 3d files, Materials, Images) are displayed in Connecter by using the Files drop-down. Check or uncheck the options you need and press “Apply”. For a faster and more efficient way of browsing files, Connecter has the convenient feature of showing you all files contained in a folder and all its subfolders. That’s pretty helpful when you’re looking for a file but don’t know in which particular folder it is located. To use this feature, hover your mouse over a folder, then hover over the context menu icon next to the folder’s name and click “Files in subfolders”. This will list all files in the selected folder and all its subfolders. You’ve moved the file to a different folder. You’ve deleted or moved the folder in which the file was located. To add a missing file back you’ll need to restore its original name and location. By default, missing files are hidden. You can show missing files if you go to the Files drop-down menu and check “Missing files” option. Not every asset needs a preview. For fast and quick previews just use this option. Use this option to render previews using the currently opened scene render settings. You can add one or more render presets to use to render your previews. You can add one or more existing previews if you already have some. From advance settings rollout you can choose where and how the previews are saved. By default Connecter will just add all previews to you current workspace database so you won’t need to worry about accidentally deleted preview files. 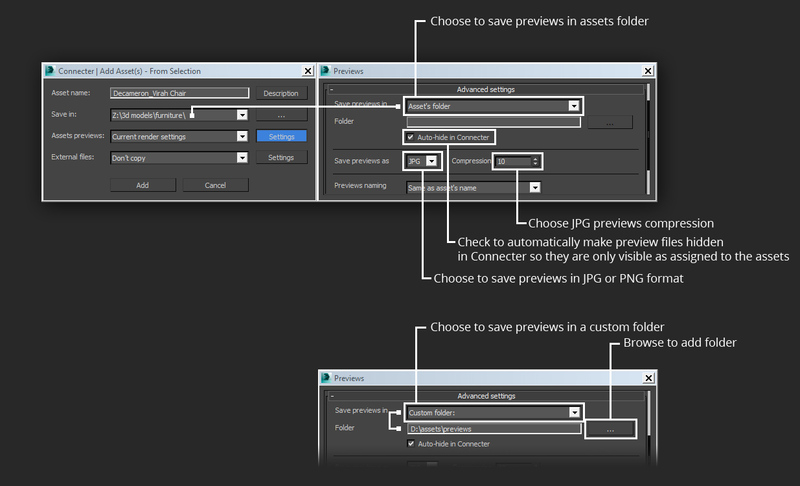 However, you can choose to save previews in another location: along with the 3d asset itself or in a custom folder.